Sunday morning should bring the coldest temperatures from Portland, Maine, to Washington, D.C.
Frigid temperatures, some that could feel as cold as minus 30 degrees, moved across the East Coast on Friday as the region attempted to clean up from a massive winter storm that brought more than a foot of snow, hurricane-force winds and coastal flooding a day earlier. "This is chilly, chilly stuff," Brian Hurley, a meteorologist with the National Weather Service's Weather Prediction Center in College Park, Maryland, said. Flights resumed at airports along the East Coast after hundreds were canceled Thursday. 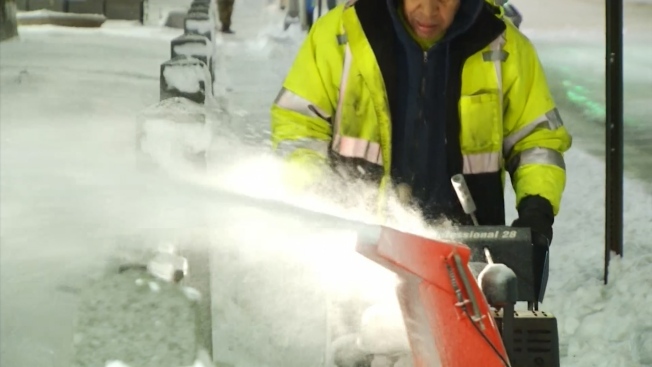 Flights in and out of Logan International Airport in Boston, Kennedy Airport in in New York and Bradley Airport in Connecticut resumed Friday, and business was expected to pick up as the day progressed. In New Jersey, gusty winds carried flames from a vacant building across the street to two other buildings Friday morning. The flames also spread to two structures adjacent to the vacant building, damaging a total of five in Newark. Two firefighters received minor injuries. This map shows the current surface temperatures. Actual temperature is influenced by many factors like mountains, convective clouds and cities. The National Oceanic and Atmospheric Administration verified Friday that water levels at the federal agency's Boston tide gauge reached a peak of 4.89 feet above the average of highest tide readings for the day. That broke the record of 4.82 feet above, set during the infamous Blizzard of '78 in February of that year. The flooding sent large trash containers floating down Boston streets, forced the shutdown of a subway station as water cascaded down the steps and prompted rescues of people trapped in cars and homes in Boston and several other Massachusetts communities by rapidly rising waters. On Friday, hundreds of Sciutate, Massachusetts, residents were without power after their homes flooded, necn reported. Many vehicles were left frozen in ice. The only place where blizzard conditions were reported during Thursday's storm, however, was Block Island, Rhode Island. The South won't be spared, either. Louisiana, Mississippi, Alabama and Georgia can expect temperatures around 15 degrees to 20 degrees, Hurley said. Northern Florida will be in the 20s to low 30s. Some animals at the Brookfield Zoo in Illinois were treated to Christmas trees full of goodies.